The Amateur Traveler talks to Dave Kerwin about his recent trip to Northern Queensland. Dave recommends 2 main stops on your trip: the Atherton Tablelands, Daintree National Park and the Great Barrier Reef. All three areas Dave recommends because of the wildlife, in some cases wildlife so strange. like the platypus, that people didn’t believe the original explorer’s tales. 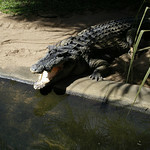 Dave also saw saltwater crocodiles, rock wallabees, tree kangaroos, and cassowarys. Throw in some amazing plans like the strangler fig and the cycad and then the Great Barrier reef and this is a great destination for lovers of nature. Lastly I was around Darwin last August and the parts of the Northern Territory near the sea also have crocodile warnings everywhere – so it’s not just Queensland!